J.S.Kairouan (Division I) added to their roster 32-year old American forward Lawrence Gilbert (200-86, college: La-Monroe). He is the second import player in the roster as Senegalese Maodo Nguirane signed here earlier. 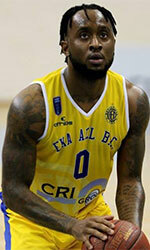 Gilbert played recently at Sopron KC in Hungarian A Division, but left the team earlier this month. In 15 games he had 8.0ppg and 3.9rpg this season. The last season Gilbert played at BC Nokia (Korisliiga) in league where in 15 games he recorded 10.7ppg, 5.6rpg, 2.2apg and 1.1spg. Gilbert played in the final of Colombian DPB in 2013. He is quite experienced player. Gilbert's career allowed him to visit four different continents, while he played in seven different countries. Gilbert tasted the life as pro basketball player in Europe, Asia, Latin America and of course North America. He has played previously professionally in Dominican Rep., Qatar (Al Wakrah), Romania (Sibiu), Saudi Arabia (Al Nahda and Al Salam), Colombia (Piratas) and Dominican Republic (Siglo). Gilbert attended University of Louisiana at Monroe until 2011 and it is his eighth season as a professional player.